So is it for real? Does this book really hold the secrets to stock market success? Well, in this book review of Trend Following, you’re about to find out. After reading Trend Following, I’m confident even fundamental investors can benefit from some simple technical rules to help them avoid getting taken advantage of their own emotions. Make sense? 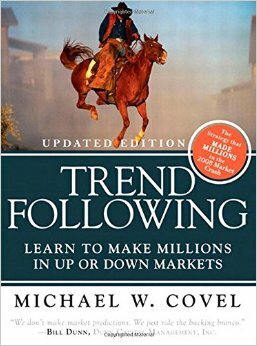 Trend Following by Michael Covel is probably the most comprehensive book on the subject of trend following trading. It’s foundational reading for anyone who is interested in learning more about how trend following works. So the title doesn’t lie. The book is also easy to read, broken into digestible sections with interesting and insightful quotes from famous trend followers and traders in the margins. It’s a great reference book you can draw from again and again. The trend following trading data is pretty compelling. After browsing through their returns, it’s hard not to give trend following a sober second-thought. But the book doesn’t stop there. Trend Following continues by exploring some of the psychology behind trend following. And I think for me at least, that really made a difference. When reading Trend Following by Michael Covel, I really appreciated the sections about behavioural economics and trading psychology. I just loved how it went the extra mile to talk about some of the psychological and emotional challenges that can confront someone who is trying to learn applying trend following trading. Because if you’ve ever done much trading yourself, you know it can be difficult at times to keep your compose and stick to your plan. The fact that trend following provides some tips and ideas for tackling this aspect of stock market success is very valuable. Now, usually at this point in the book review, I try to find something negative to say. Because I want to give you a balanced review. But the truth is, I read this book in a couple of days, took lots of notes throughout, and had a lot of trouble putting it down. The book was engaging. And although there wasn’t any focus whatsoever on fundamental analysis, it was very interesting and applicable for traders and investors. The only other thing worth mentioning is that while trend following can be applied to stocks (and the book has a great appendix on this), the majority of professional trend followers are commodity trading advisors that trend follow all sorts of different markets. This makes pure trend following a little bit tougher to access for the individual investor. By now, you should see that Trend Following had a very positive impression on me. I found techniques and ideas that I think I can apply to my investing. For that reason alone, I think you’d be wise to check out Trend Following on Amazon, and see for yourself. Of course, if you’re still not convinced about this book, you can always watch the video book review to hep you get even more information on Trend Following . This entry was posted in Stock Ideas and tagged investment book reviews on January 31, 2016 by Jworthy.